My wife and all of her lady friends from work absolutely love these eco-friendly bags. They are spreading the word around about your website (Custom Earth Promos). Great color variation. Going with an eco-friendly product to promote my business was most certainly the way to go. Very pleased with my order. Thanks Custom Earth Promos. Just placed my order for these one of a kind custom made bags and couldn't be more excited to sell them at my next marketing event. Thank you CEP for the business. Our company just recently place an order for this specific product. The design and logo came out perfectly just as expected. The bags look outstanding and can't wait to start selling them at our upcoming event. These Eco-Friendly bags are exactly what I was looking for. My company is hosting an event this upcoming weekend and we are very excited to promote your reusable bags. Can't wait to place another order shortly. Sold these bags at my companies most recent marketing event. Not a bag was left after the event. Very successful. Thanks again CEP. 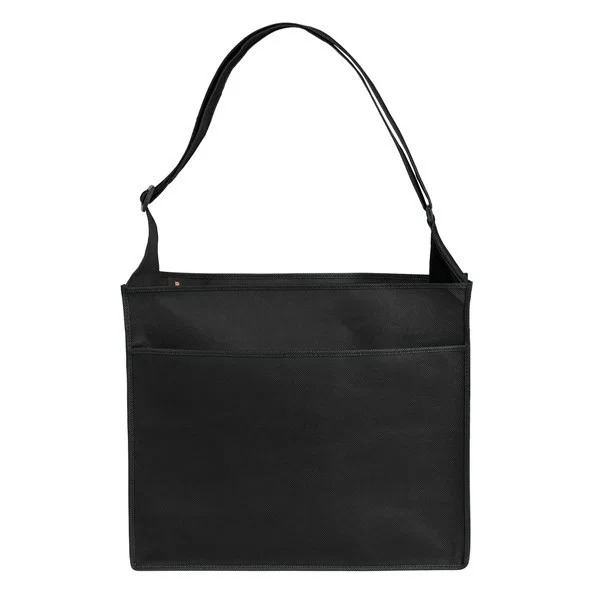 Our customers love the functionality of this bag in terms of the extra pockets and comfortable handles. We need to order more again soon since we are running low from our customer demand! Our company was looking into eco-friendly alternatives to the typical bag and we were not disappointed with how this bag turned out. Linking our company to an eco-friendly message was certainly the way to go!! I bought these for both of our offices its a great way to promote. Our logo really shows up nice and the tote bags, will be ordering again. I just received my bags and I am so excited to hand them out at my next marketing event! So pleased with the customer service and the quality of these bags. My logo shines! My ordering process was seamless and the final product exceeded my expectations! I ordered the eco messenger totes for all our employees. They are always on the go. Helping the business to gain exposure by having our brand seen is a great bonus. Our clients love these totes. They are highly functioning and perfect for travel. The adjustable shoulder straps on this tote bag is such an added bonus. This product is unlike any other I came across. Truly amazing! This bag is functional and fashionable! Very excited! This is the highest functioning eco-friendly bag on the market without a doubt! These bags are perfect for my employees. The document pouch is a great addition! This bag is so valuable! Ideal for our company and clients. Super impressed with these bags. They are durable and the bottom insert really provides extra support. Our reusable totes will carry your company name, logo, and/or marketing message with style. We use premium polypropylene with a heavy weight to build the bags, and reinforce them with other fortifying techniques and elements that increase the durability and longevity of the finished product. 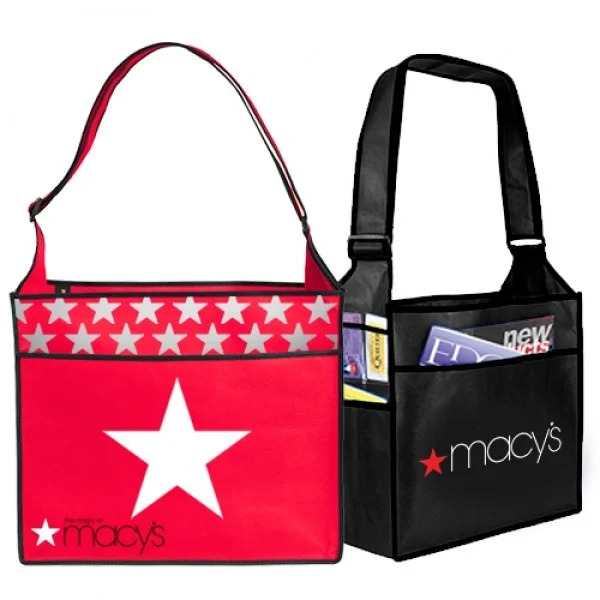 Leave a lasting, eco-friendly impression with our customizable messenger totes! These tote bags are not only stylish and durable, but are also made out of 100% recycled materials, meaning you'll be promoting your business as well as environmental awareness! 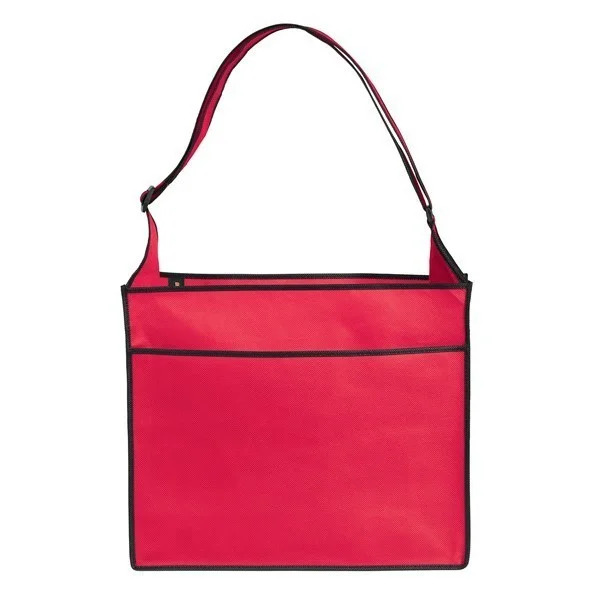 When looking for a stylish reusable bag to fit your budget, look no further than our eco totes! 100 GSM non-woven polypropylene is used in making these tote bags, ensuring the quality of your final product. Gusset pockets, adjustable shoulder straps, document pouches, and reinforced plastic inserts at the bottom are the details that set it apart from other reusable bags! Your clients will be able to use this bag for day-to-day use, and its durability will guarantee it's value for years to come. Screen printing allows us to print custom logos, company names, marketing messages, and artwork using high-quality inks that won't fade with time or use. By ordering overseas, your options for customization become limitless! Minimum orders for overseas start at 1,000 pieces, and our competitive wholesale pricing is guaranteed to fit your budget. We can do a PMS color match on our reusable eco totes for orders of over 10,000 pieces to fit your company's color scheme or logo. Add pockets, closures, and even customize the trim and handles however you want! This eco-friendly bag is sure to stand out from the crowd, and your slogan or logo will leave a lasting impression on everyone who sees your custom promotional bags out on the town.